Clasically trained singer, pianist, songwriter, and composer Sarah Ragsdale has captured her adventurous "Piano Woman" experiences into a whimsical journey of storytelling through pop, r&b, jazz, and folk influences. 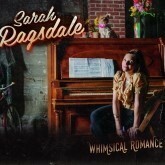 Singer, songwriter, and pianist Sarah Ragsdale has captured her adventurous "Piano Woman" experiences into a whimsical journey of storytelling through pop, jazz, and folk influences, culminating into her own unique style. Sarah's diverse artistic background, from Appalachia to West Africa, has provided a large palate to describe very personal and emotional accounts for herself and others. She has toured and performed live in America, Europe, Asia, and Africa making appearances on major international television networks including BBC World, Univision, France24, and Radio France Internationale. This collection of 10 songs is about that romantic story called life, and the ups and downs that come along with it. Based on true stories, mixed with some fantastical exaggerations, this is a fun and playful album of the vast array of emotions that come along with relationships. Written at various stages throughout her life, these are raw stories that have been tried and tested at the piano, even with audience involvement – some relying on percussive snapping and clapping. Feelings range from happiness and pure bliss like in the song “This Kiss”, to a character of craziness and denial like “Next Time”, to more intimate reflections like in “Paranoia”, while others emit strength and moving on. Raw and rustic, catchy and melodic, this album has hints of blues, jazz, and even ragtime. CD package includes a picture/lyrics booklet.